Two works by Russian painter Nicholas Roerich are to go on sale at Christie’s auction house in London on June 1 as part of a substantial list of Russian lots. The money earned from the sale of the works, “White and Heavenly” and “The Host of Gesar Khan,” will partly go to the Nicholas Roerich Museum in New York, which submitted the paintings for auction, Christie's press service told RIA Novosti. The paintings are valued at around £500-700,000 ($760,000-1 million) each. “Both are paintings with excellent provenance that have never been exhibited for auction,” said a Christie's representative. 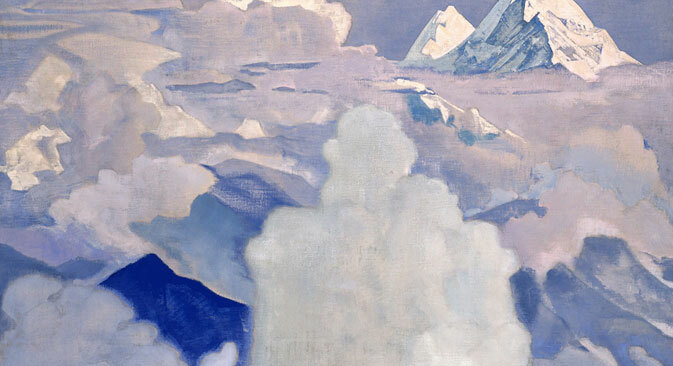 Painted in 1924 in India, “White and Heavenly” is one of the paintings from the series “His Country,” devoted to the landscapes of the Himalayas. “All the works from the ‘His Country’ series are owned by museums, so this is a unique opportunity to buy one," said Christie's. “The Host of Gesar Khan” painting dates to 1931 and belongs to the period when Roerich came back to his estate in India’s Kullu Valley after spending a year and a half in the U.S. and Europe. “These two great works have been put on auction to make the collection of Roerich's museum in New York fuller and more representative,” said Daniel Entin, the director of the museum. “With the money they bring in we will buy other important works of the artist's heritage, which belong to those periods of his art that are less represented in our museum,” he said.